Creating Native American Style Flutes by Hand Since 1995. Uncondtional Guarantee on All Laughing Crow Flutes. Using a Wide Range of Woods . Concert Tuned Native American Style Flutes to Fit Any Budget. Most Common Keys Available. Also Tuning to A=432 Upon Request. A Wide Selection of Accessories for the N.A. Flutist. 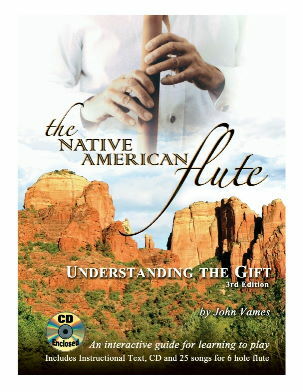 Method books, music books and teaching materials for the Native American Flute. Music written, performed and produced by me, Laughing Crow. 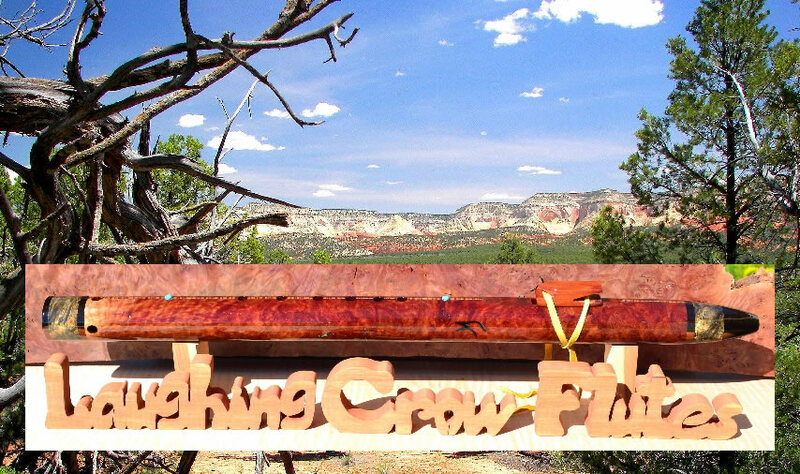 Hand Made Flutes by Laughing Crow and other well known makers. Soothing Native American Style flute. "Music has charms to soothe a savage breast". Yes, it's a real quote: Music has the power to enchant even the roughest of people. This proverb comes from the play The Mourning Bride by William Congreve, an English author of the late seventeenth and early eighteenth centuries. You can check out samples of my music here and experience the soothing tranquility of the Native Flute. Here, you can get to know me a little better. The guy that wears all the hats around here. A handy little amp with plenty of volume for the Native American Flute. The Micro Cube can run on A.C. or batteries. Has built in reverb or delay to give you that "Canyon Sound". I use it and swear by it. Can be ordered with or without a great little lavaliere microphone that can attach to your flute or your shirt. Click here to learn more about this wonderful little amplifier..
You can mail a money order. Probably best to contact me first to work out the particulars. Or, you can use my Secure Order Form located on my legacy web site..
A synopsis of warranty and return policy. Taken in my workshop with the help of my assistant, Clay. One of my first tries using the Lichtenberg Process to decorate a Western Red F#m flute. This is done with very high voltage and is extremely dangerous. People have died doing this, so if you don't know what you're doing, don't even try, OK? However, the results can be very interesting. I'm using a neon light transformer that puts out 8,000 volts. I have a foot switch, sometimes called a "dead man's switch" to turn this home made device on and off. I'm also using a Variac to control the input voltage and help regulate the burn. Lots of videos out there on YouTube that tell you how to do this. No, I'm not frying my hair. This video was taken in Big Sur..
We were traveling up Highway 1 and I decided to pull off the road and scramble out to a cliff overlooking the bay that you see in the background. I	can't believe that happened over10 years ago. My, how time flies! 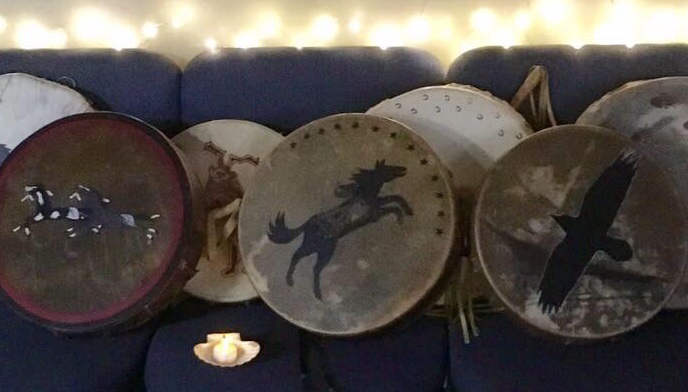 A wonderful source for healing, drums and drum making. Holistic Health care addresses any mental, physical, emotional, or spiritual imbalances that may affect your well-being. Optional Backgrounds allow you to quickly change the look of your site, by changing the background image, edges, borders and shadows. Instead of having to dig through stylesheets and trying to adjust the backgrounds the hard way, you simple attach a stylesheet to your page, and the hard part is done. You can 'still' adjust the backgrounds, add your own and tweak as you like, we've just made it easier by applying the various backgrounds via an externally linked stylesheet which you can further edit it you need to. Hi Richard, Just wanted to contact you to let you know that I am very impressed with the appearance and fine craftsmanship of this flute and the full, sharp sound it gives! I will definitely do business with you in the future if I decide to purchase the drone flute, I will likely do so in the spring of 2018! Thanks again, you are the best!!! Picked up my new drone flute this AM and just wanted to compliment you on a beautiful piece in all regards. Not only is it extraordinary to look at, but more importantly the sound is spectacular. As with the other flute I have from you, I couldn't be more pleased. They are superb instruments! I received the flute today and it is just gorgeous! And the sound is phenomenal! Thank you so much for making me this piece! I am so glad I waited, your a true artist, thank you so much! Hello Richard! I just received my flute and WOW! The craftsmanship and beauty is top shelf brother and the voice this flute has is incredibly mellow and absolutely beautiful. Thank you very much for the speedy shipment and for offering such a well crafted product. I look forward to deciding on which one will be my next Laughing Crow flute. I can see myself owning and playing many more of your hand crafted works of art! Have a very blessed day brother! 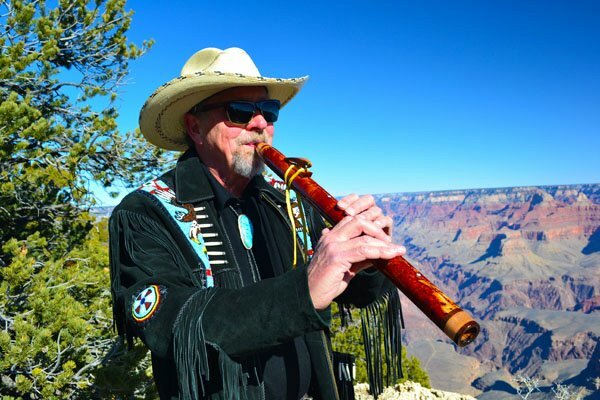 "It's like the sports car of Native style flutes"
The terms "Native American Flute" and "Indian Flute" are used to describe the style of flutes and music that I create. It does not imply that the flutes and/or music are made by a member of a Native American tribe. Actually, I am, as most of you are, a "Native American". This is due to the fact that I, like so many of you, was actually born in America. I also have Cherokee blood in my ancestry. However, as a non "card carrying Indian", in order to comply with mandates set down by The Department of the Interior I have included this disclaimer. Update to HTTPS: This site is now secure. The home page may not show the HTTPS when you first arrive, but I'm working on getting all the links in the site to go to HTTPS-only pages. I could get the home page to show HTTPS, but there is a bug preventing the initial landing from showing the secure indicator. Also, most of the pages are now compatible with mobile devices, including tablets and telephones. And, I have updated my Music Downloads app to comply with all the latest requirements. If you check out the "Music Shop Page" the links to the different albums take you to pages where you can listen to the music with a new player that I've installed. Just too many improvements and "bug fixes" to list and many, many more to come. 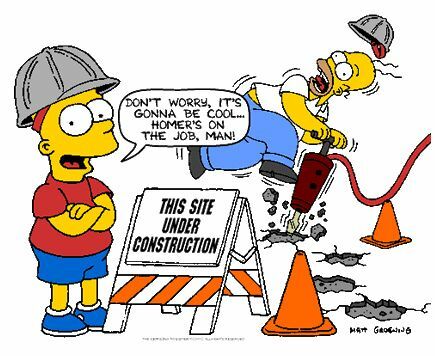 I hope the site is becoming more user friendly. Yes, I'm in Upgrade Hell. Google is nagging because my "old" site isn't friendly for Mobile Devices, which almost everyone is using now. Things will be a little "messy" for a while. "Saturday Night and I Ain't Got Nobody" Sounds like the title to a song! Making progress, slowly and in fits and starts. However I think this flute maker is starting to the hang of learning to be a Webmaster. Whoo Hoo! Heck, I think even Google is starting to like me a little better.